Editor’s note: Below, The Service Council‘s Sumair Dutta recaps key takeaways from his latest research surveying field service technicians on the industry and new technology. For more than a year, I’ve been keen on learning more about field service from the folks on the front lines. 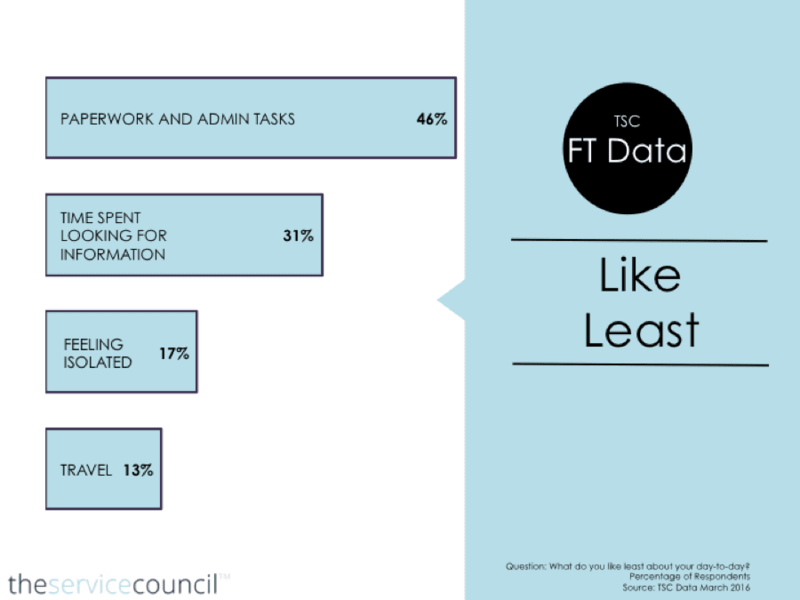 We hear about what service leaders think, but we seldom hear from front-line technicians themselves. So, we undertook a two-part survey project aimed directly at field technicians. Participating technicians weren’t required to identify themselves or their employers, so they could remain anonymous and offer honest feedback. Overall, we were pleased with the results. Fifty technicians participated in our first survey, which focused on the field service profession, and more than 100 participated in our second survey, focused on technology. Overall, technicians see technology as a positive — especially if the technology serves to remove obstacles. For instance, 46 percent reported that what they liked least about their work was the time spent on paperwork and administrative tasks. In terms of more emerging technology, most are fairly positive on the potential impact of the Internet of Things (IoT), augmented reality, and live video. Smart bands and watches, on the other hand, elicit skepticism. The general lack of resistance tied to sales responsibilities. Only 19 percent reported that they were dissatisfied with level of pressure to sell. Nearly 40 percent, meanwhile, were satisfied with the level of sales responsibility placed on their shoulders. I’m still compiling results, but anticipate releasing our “Field Service 2016: The Technician’s Perspective” report on March 31. For those interested, please feel free to contact me at moc.l1555891949icnuo1555891949ceciv1555891949res@d1555891949s1555891949. It will also be featured on www.servicecouncil.com. Sumair Dutta is the director of digital transformation at ServiceMax. In his role, he works closely with ServiceMax customers to maximize the results from their business and digital transformation journeys. He works closely with leaders of service businesses to define and shape their service vision while working hand in hand with implementation teams to execute on established service plans. Sumair is a thought leader in the field service and service management spaces and has conducted numerous research projects in the areas of field service, customer support and business strategy. He brings more than 15 years of experience in studying, analyzing and guiding field service organizations, first at the Aberdeen Group and most recently as the chief customer officer at The Service Council. Thanks Sumair! Really appreciate the information about technicians and often end users FSM software. We often go on ride-alongs here at ServiceMax so we are able to better understand how technicians operate on a day-to-day basis. Seeing some aggregated data for technicians should be eye opening in many ways.